Environmental data was measured by the Tier 1 contractors and provided to Crossrail Ltd (CRL) as part of the 4-weekly and quarterly reports. CRL collated the data centrally and created environmental dashboard reports which were provided to the Crossrail Sustainability Committee, to directors in the Delivery directorate who were collectively accountable for contractor performance and to project managers responsible for individual contracts. The dashboards provided information on how well Crossrail was performing overall, but also how individual contracts were performing against the various targets and by comparison with each other. The content of the dashboards was reviewed every year to reflect the status of the programme. The visibility of environmental performance provided by the dashboards was a key driver for achieving CRL’s environmental objectives and targets. 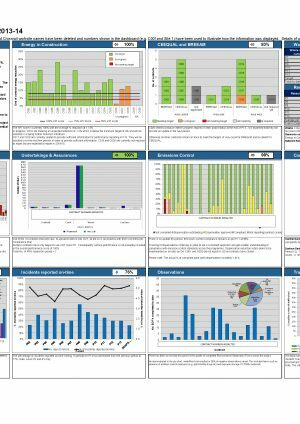 A selection of sample dashboards reports are available to view in the document links below.